To make key concepts come to life, the book gives readers realistic case studies of students with a range of disabilities, analyzing both success stories and situations in which a different approach could have led to better outcomes. And with the "fast facts" in every chapter, readers will have quick insights from current research to inform their students' transition plans. An invaluable one-stop guide to the basics of transition planning, this book is a must-own for anyone supporting young people with disabilities as they navigate life beyond the classroom. "Successfully addresses planning for students with various levels of support needs." "Provides a fine guidebook collecting all of the basics of transition plans for young people with disabilities and comse from one of the top authorities on helping young people transition to independence." "Practical, outcome oriented, and comprehensive . . . Practitioners in schools and adult services, individuals with disabilities, and families will all find this book valuable." "Reflects the many years of personal and professional experience the author has invested in seeking an improved the quality of life of persons with disabilities. This book brings a mix of research-based evidence and personal experience applicable to a wide range of persons involved in the process of secondary school to adult transition for persons with disabilities." "With so many new special education professionals thrust into transition related positions without preparation or training, this book will be a godsend. Its engaging style and practical resources will provide a 'one-stop shop' for transition professionals seeking to implement effective practices." "Provides the kind of how-to advice that so many teachers want and need. While based on the best research available, it answers the critical question for teachers: how do I implement this in the real world?" 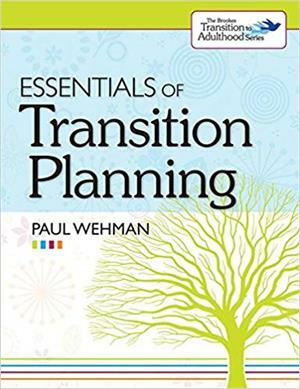 "Yet another important contribution by Paul Wehman to effective transition practice. This highly useable resource is a must for anyone involved in helping youth plan for the transition from school to work and adult life." "A must-have book that not only includes essential information on transition planning but also provides a huge selection of worksheets to help professionals effectively implement each step of the process." "Paul Wehman and his colleagues continue to 'ring the bell' with their books on transition services. Essentials of Transition Planning is loaded with information for professionals working with students with moderate to severe disabilities." What to Address in the Transition Individualized Education Program?